The Digimon Event at Victory Pointe (Pittsburgh, PA) was a unique event. We had never done an event there and did not know what to expect. Victory Pointe is an arcade in Pittsburgh that has an upstairs that is used for table top gaming along with hosting fan gaming events. The event we attended was all Digimon focused with Xbox Ones and other systems playing current and previous incarnations of Digimon titles and a big screen TV showing the classic anime. I cannot fathom that the original Digimon show is considered “Classic.” The show boasted a few vendors besides us. One of which was a fan artist that had hand crafted Digimon plush. I was really impressed with the quality and design of her plush. I wish they were licensed as I would consider carrying them. The organizer of the event also bought a number of items on Amazon to give away as prizes. It is nice to see a fan do this for the community. This was our smallest setup we have ever done. It consisted of two pieces of grid wall, a couple of corner shelves propped up against a 3’ x 3’ table that the venue provided. I am grateful that they provided the table as the space for vendors was very limited. For people who do vend there, a standard 6’ or even 4’ table is a really tight fit. The venue would like you to bring your own table, but in all reality fight hard to get one of those few tables. If I owned a 3’ x 3’ square table I would bring it there. Another option would be to bring a 4’ or 6’ quarter round. The arch of the table would work with the space. In hindsight I should have taken a 5’ x 1’ table to provide a little more stability, but live in learn. 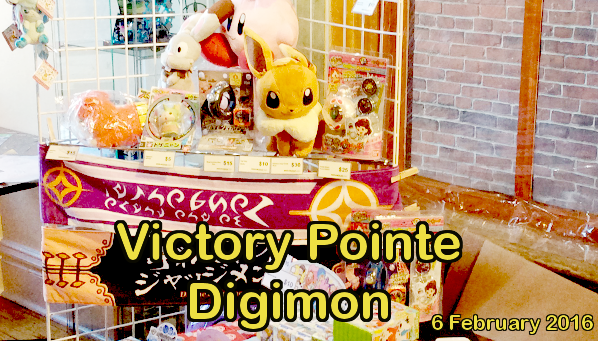 For this event we took every piece of Digimon merchandise we had. There is a shortage of new merchandise at the time. To augment our stock for the event we had miscellaneous blind boxes with as close a tie to video games as possible. We also had Pokemon and other Ninetndo releated merchandise. All in all for the price to be at the event and the fact that it was organized by someone who was a true fan this makes it an event that I would definitely do again. The organizer has stated he plans to have another Digimon event there.